Set in a post-apocalyptic Japan of the near future where the sea level has risen and flooded much of the coastal areas and Mt. Fuji has erupted within living memory. The population has been considerably reduced and political and technological institutions have broken-down. Local communities have become nations and telephone and television no longer exist (although coffee vending machines and streetlights stubbornly continue to work). There are strange new animals and plants (like flying fish and glowing streetlight trees). The remaining people have adopted a slower-paced, simpler way of life and rely more on each other. Along with the human population are some intelligent, humanoid robots. One of the robots, a female named Alpha, runs a cafe by the same name in the country outside of what remains of Yokohama. 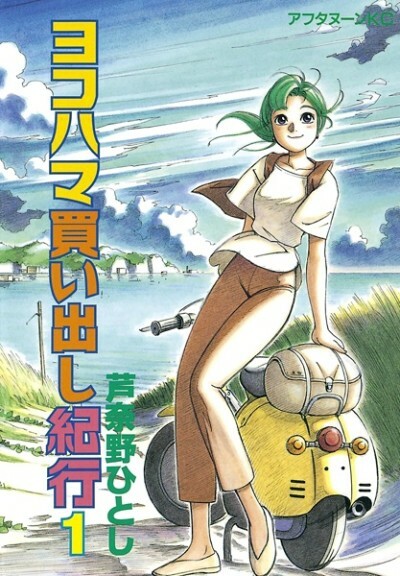 With her trusty motorscooter and her camera she travels around the area making friends with the humans and robots, having new experiences and observing the passage of time. Note: Includes the epilogue, Touge, published with the 10 volume re-issue. Chapter count also includes 'Chapter 0' from volume 1.